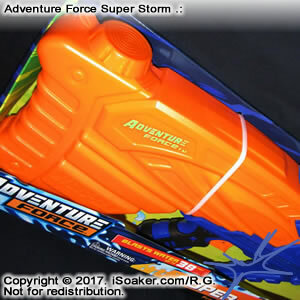 The Adventure Force Super Storm is the largest water blaster released by Prime Time Toys in 2017. 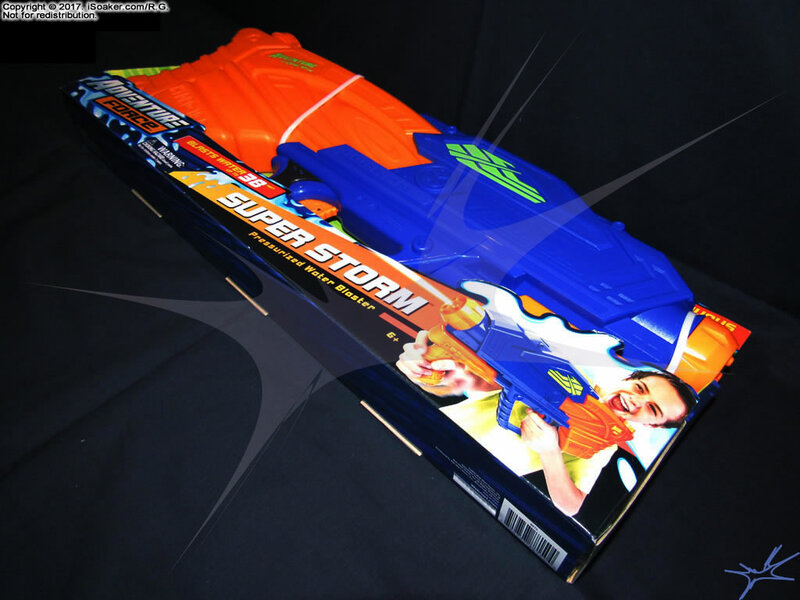 Prime Time Toys is a lesser known manufacturer that makes a variety of products including brands such as "Dart Zone", "Jump Zone" and "Float Zone". 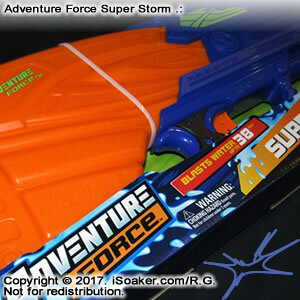 The Adventure Force brand is a Walmart private label and appears to be relatively new, though the brand may be a few years old or so. 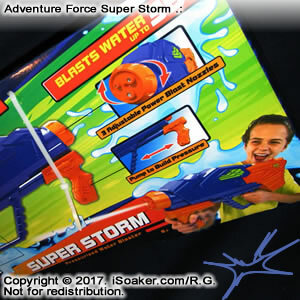 That said, others had reported that the Super Storm water blaster made use of an elastic bladder-based pressure chamber. 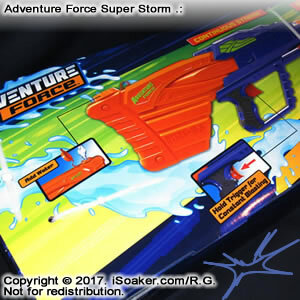 Because of this, I opted to pick up this and the Adventure Force Hydro Blitz just to see how well they truly performed. 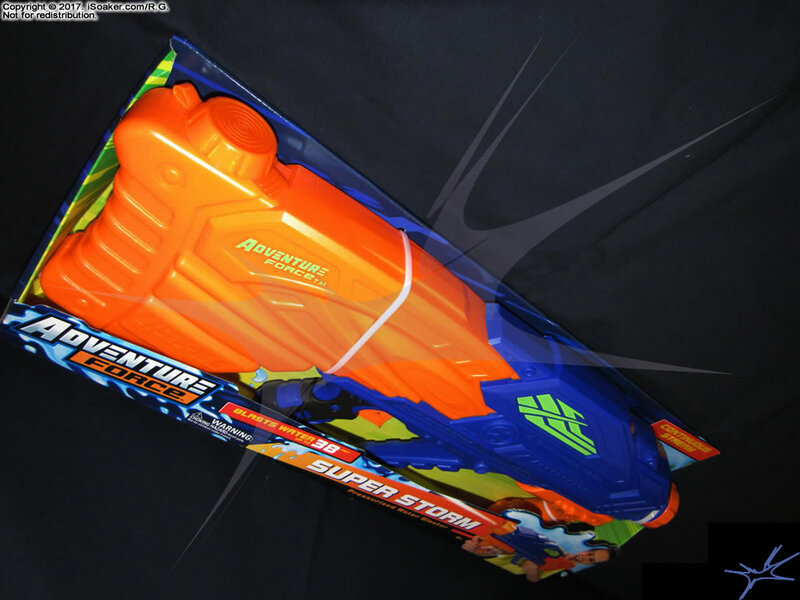 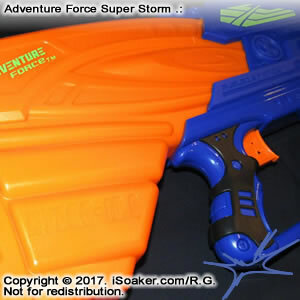 Note: BuffDaddy also reviewed the Adventure Force Super Storm on his blog; his experiences with his blaster, particuarly regarding its pumping, are rather different than mine. 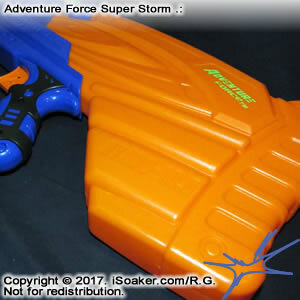 It is quite possible that the one reviewed here has a defective pump, but considering there was no visible damage to the water blaster nor its packaging, it is unclear how common a newly purchased blaster behaves like the one reviewed here versus the one reviewed by BuffDaddy. 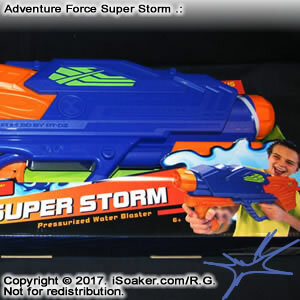 I welcome reports/reviews from anyone else who happens to try out this water blaster. 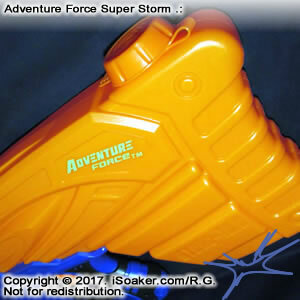 The Adventure Force Super Storm has an interesting angular-based design with a variety of textures and details on its various surfaces. 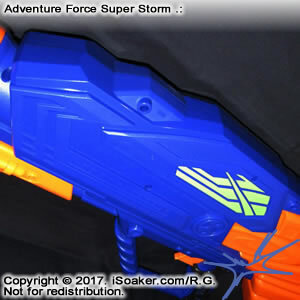 Sporting a nozzle selector with three options on its front, the Super Storm has a remarkably large and well-sculpted pump grip. 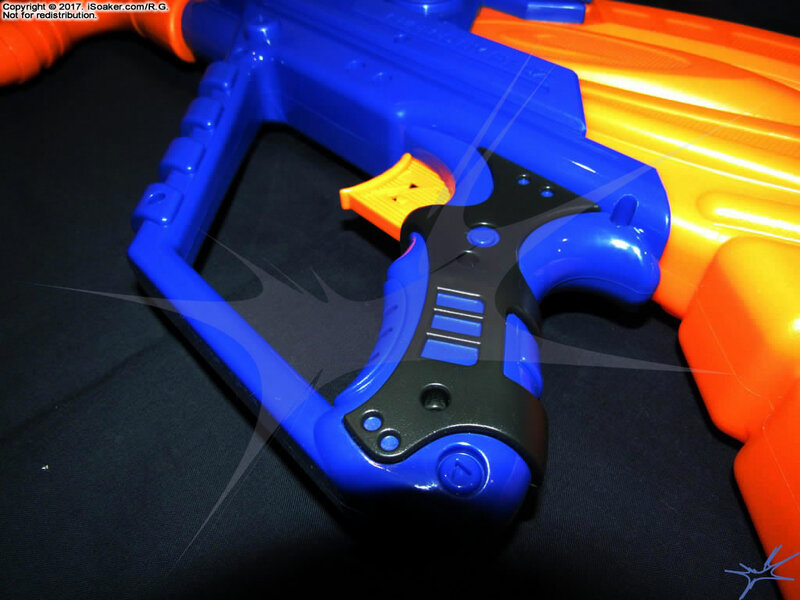 nicely textured trigger grip, and additional line elements on its reservoir to prevent it from having a flat, overly plastic-y look. 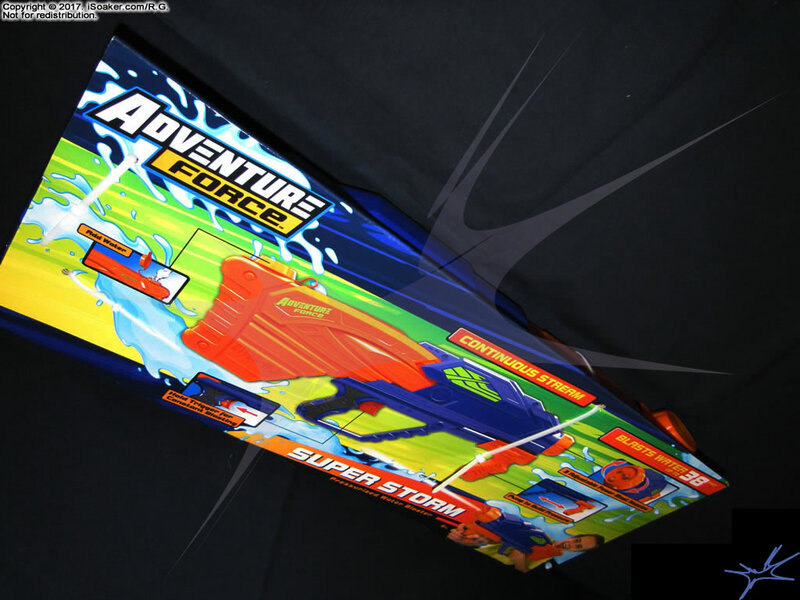 Part of its side is decorated wtih some green shape art that does not appear to have any particular meaning. 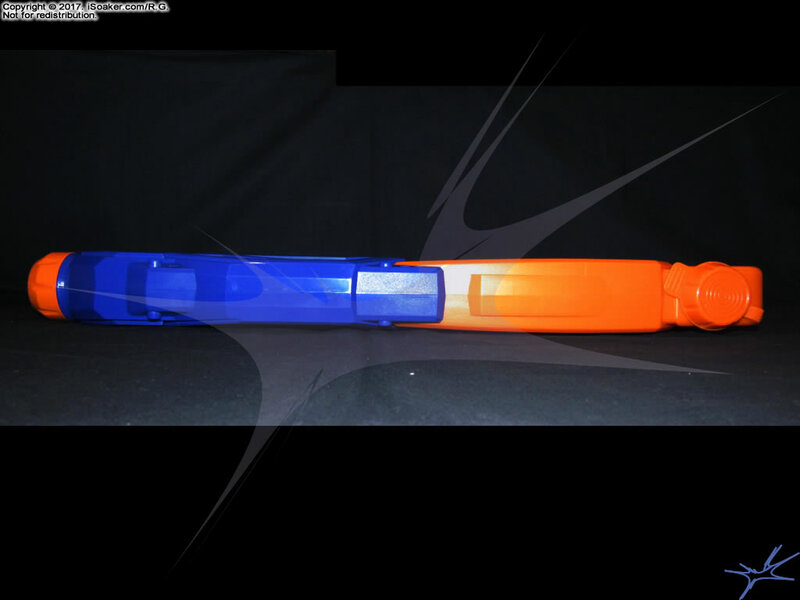 The words "Fueled by PT-DZ" appear on the side, but there is no explanation what this term might mean. 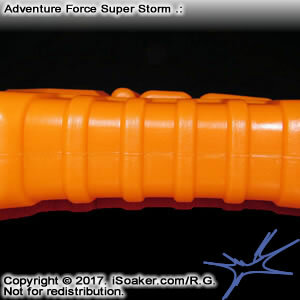 The Super Storm feels built from decent quality plastic and the additional texturing and details enhance its feel. 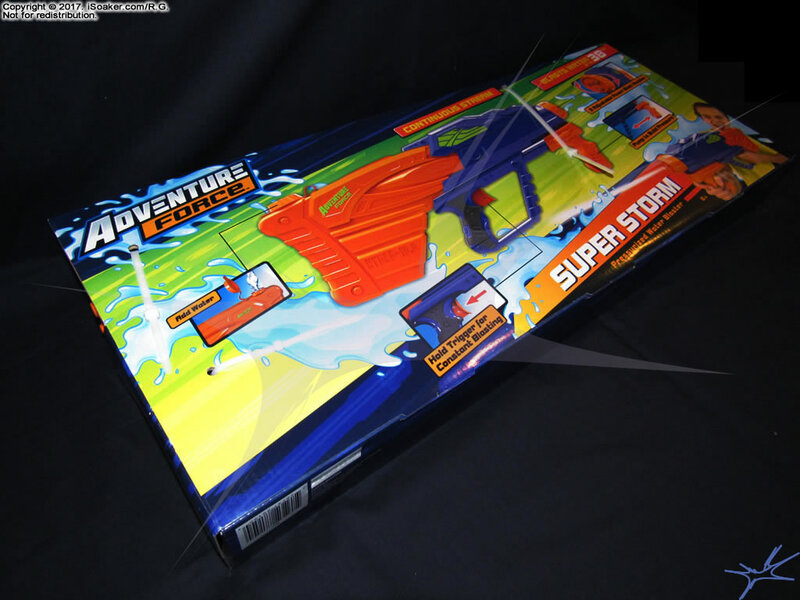 Straight from its packaging, this water blaster feels like it has some decent weight and shouldn't take long to get ready for action. 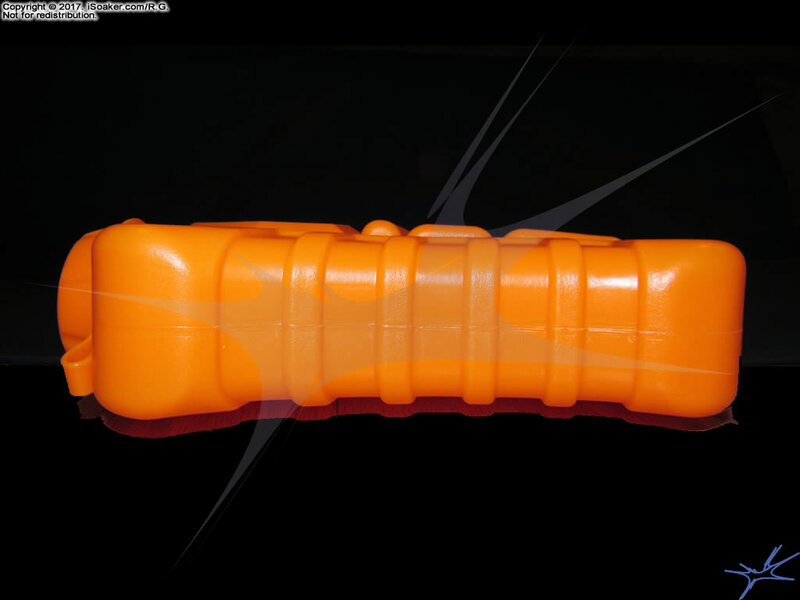 However, things become less positive once it is filled with water and prepared for blasting. 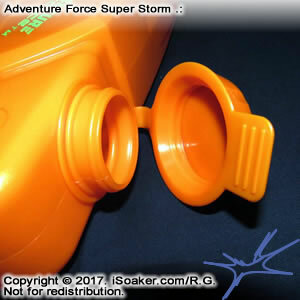 The Super Storm's large reservoir makes the back side feel rather heavy when filled. 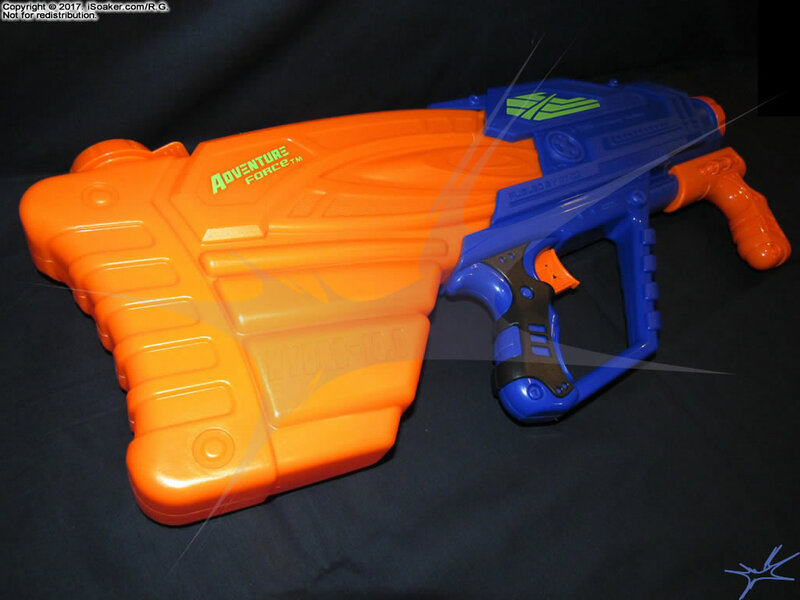 Perhaps some may be able to use its rounded design as a shoulder stock, but for me, the reservoir is not quite long enough to make it comfortable to use that way. 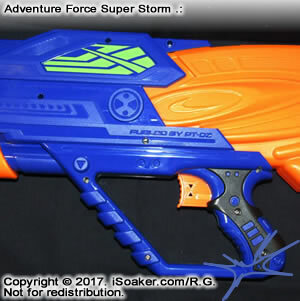 The reservoir is also only cappy with a snap cap that has a small hole in its top to let air in as water is pumped from it. 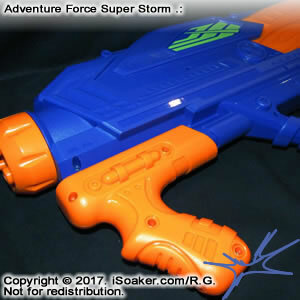 Unfortunately, such caps are prone to leaking if the blaster is angled in ways such that water is up against it. 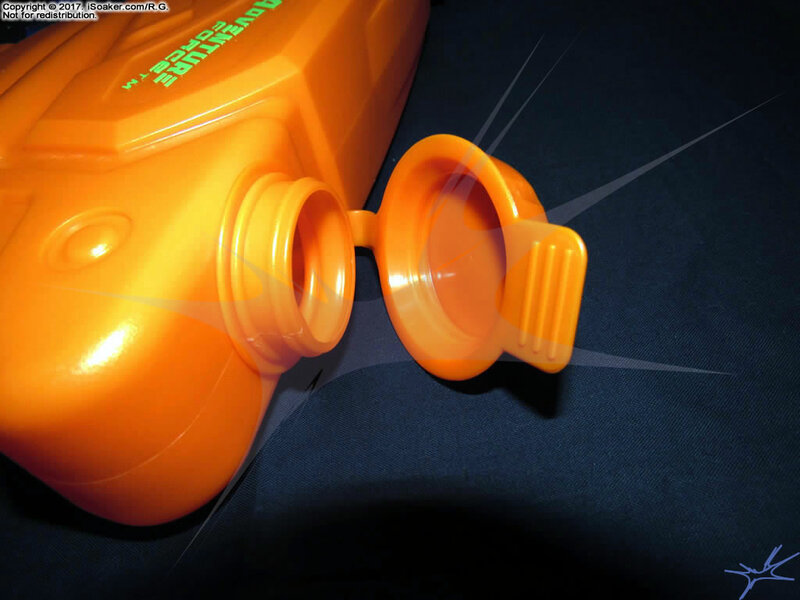 It may also dribble/spray slightly when running. 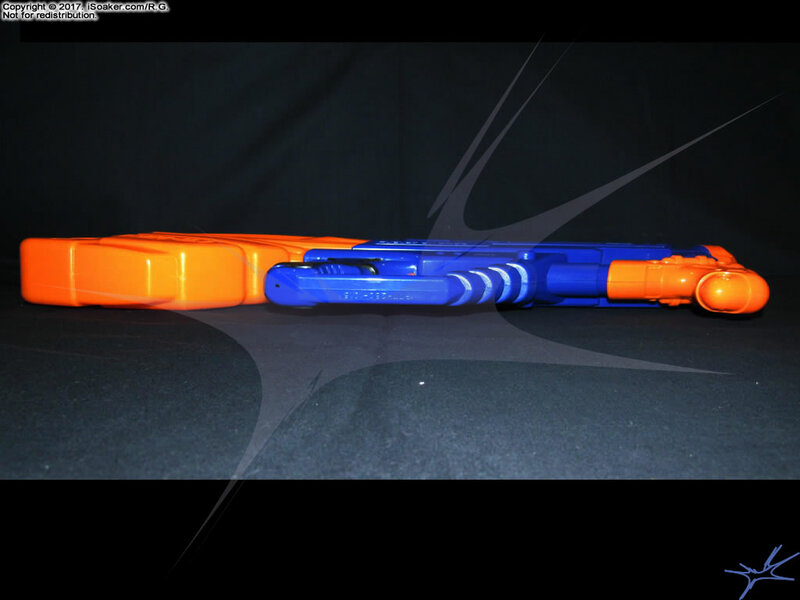 Not a horrible problem, but something to make note of. 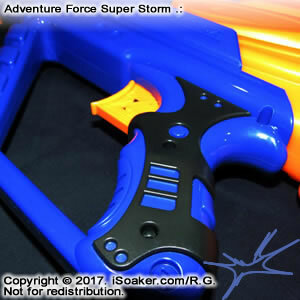 That said, while the trigger grip and pump grip are comfortable to hold, pumping is not as smooth and easy as expected. 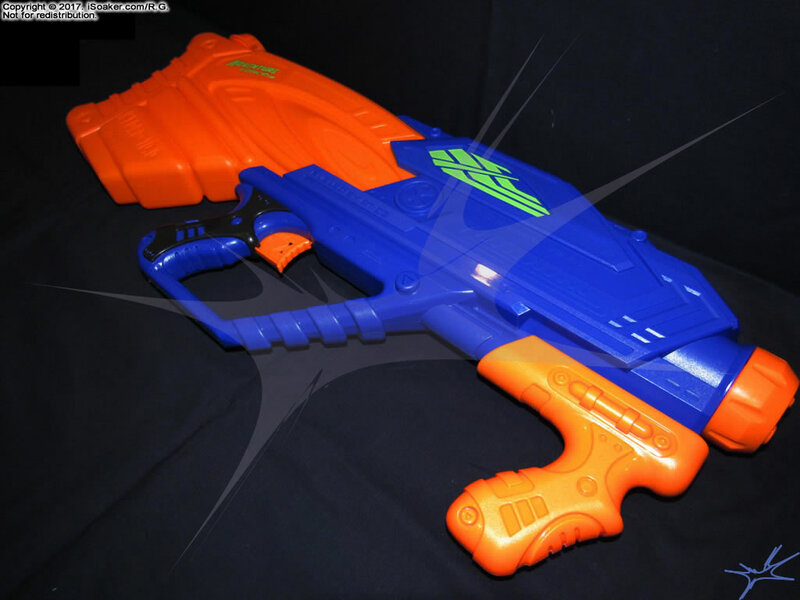 First, the pump rod length is remarkably short for a water blaster of this size; the pump only slides about 5 centimeters (~2") out from the body and can only push a rather small amount of water per pump. 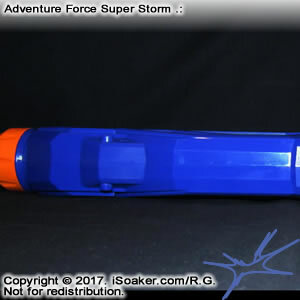 I am unsure whether this is a problem with all Super Storm water blasters, but the first one tested required a solid 30-40 pumps to properly pressurize the chamber with the first 10-20 offering very little resistance. 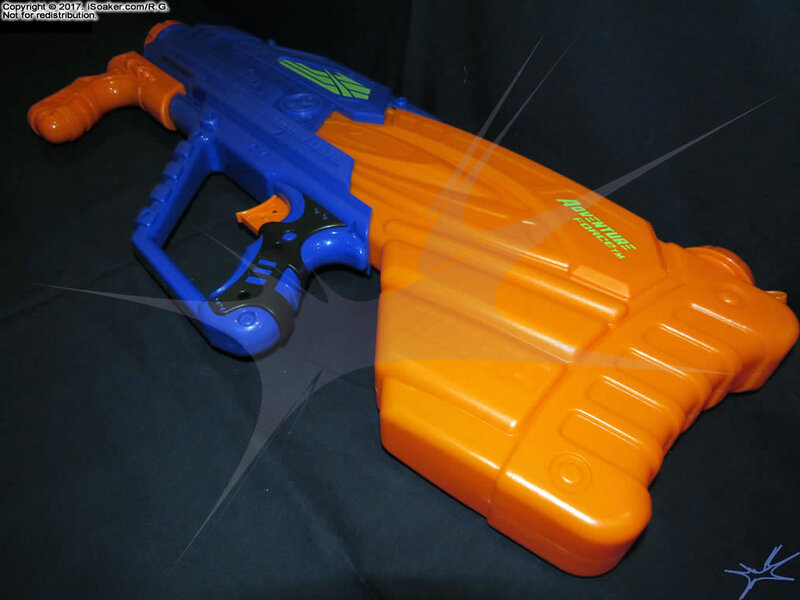 However, as pressure build in its pressure chamber, pumping does get more difficult and the pump grip seems to bend the pump rod somewhat under the pressure. 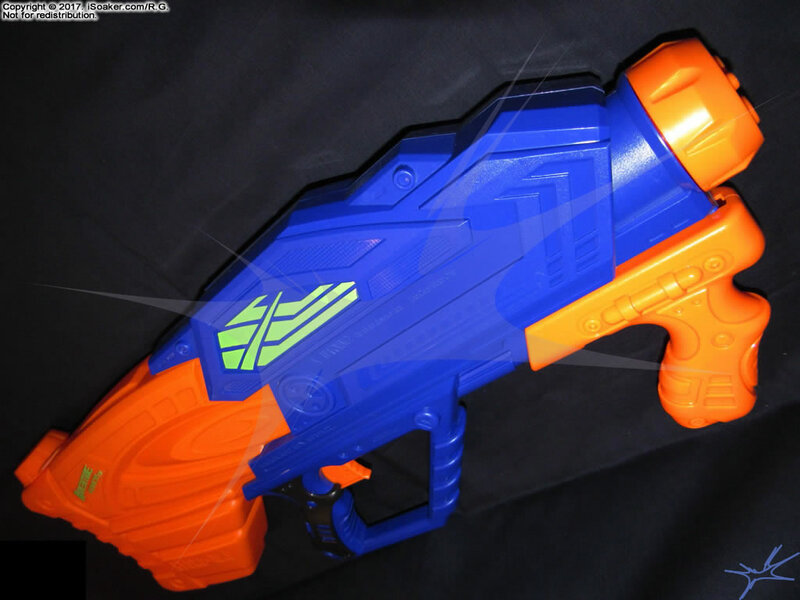 The trigger also becomes harder to pull as pressure increases. 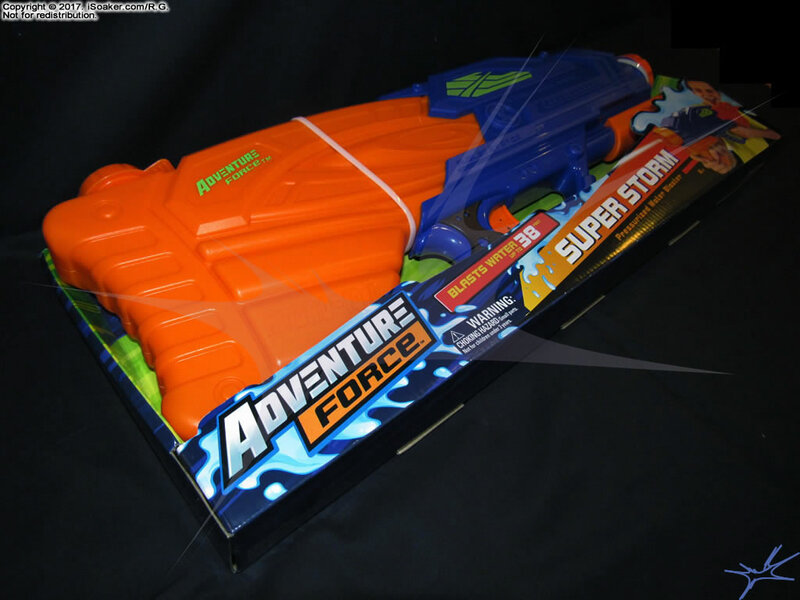 Of course, some may say that is just a minor price to pay for good performance. 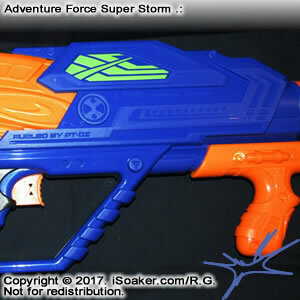 Ergonomics aside, the real question is: How well does the Adventure Force Super Storm perform? 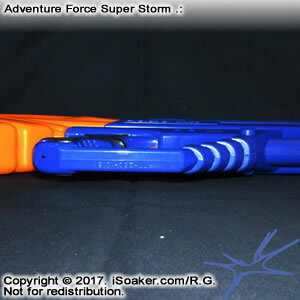 Update: I decided to pick up one more Adventure Force Super Storm to see whether it behaved the same. 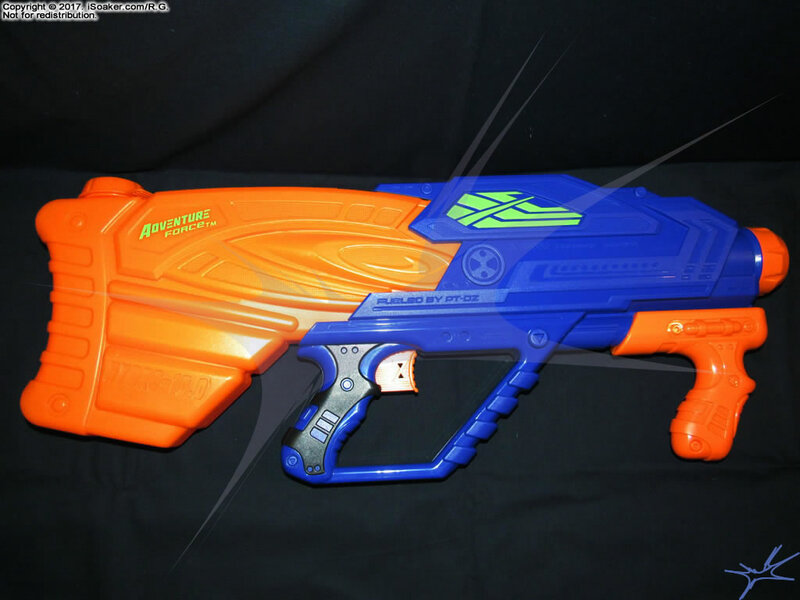 This time, the pump seemed to be far more consistent, but still low in volume (~9mL per stroke). 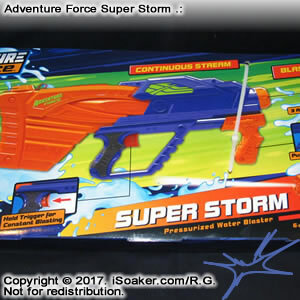 While it charged the pressure chamber more quickly (7 or so full pumps), the other shortcomings of this water blaster model remain. 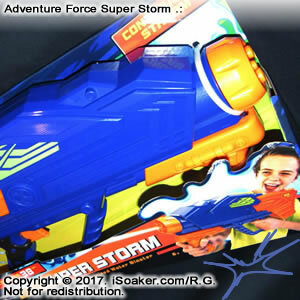 The Adventure Force Super Storm appears to pack a good punch on its largest nozzle setting. 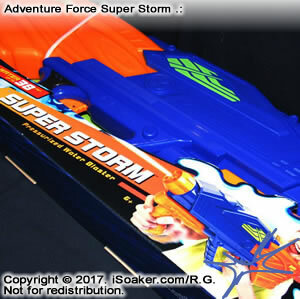 Its elastic rubber bladder consistently overpowers its nozzle valve; this means that once the stream begins, the Super Storm will continue to fire until it runs out of pressure, even if the trigger is released. 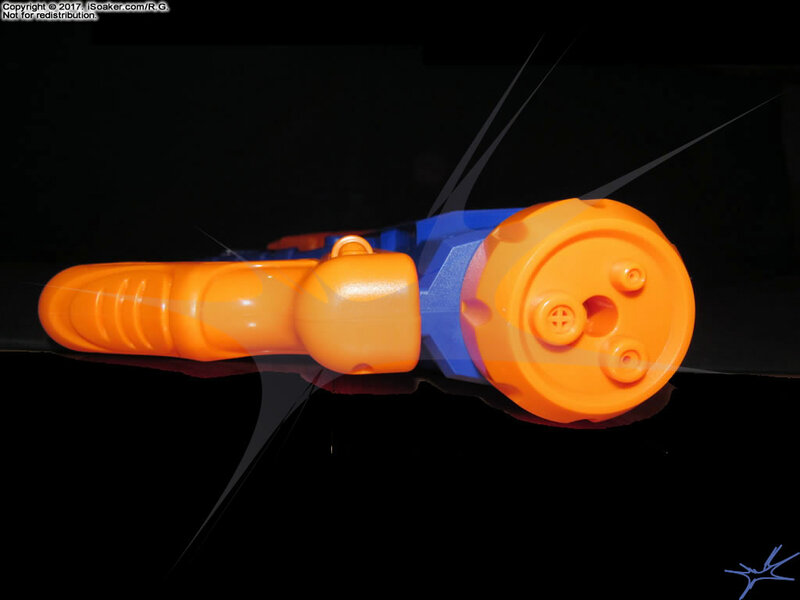 Tap shots were simply not possible on the model tested. 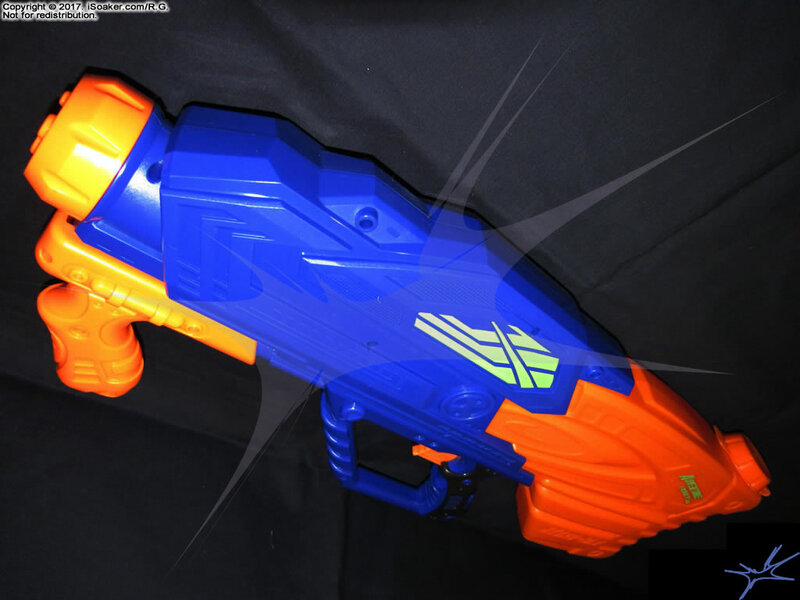 However, despite the apparent power in the various stream settings, the actual output from both the large and burst settings produced only around a 1x stream (1oz./sec or 30mL/sec). 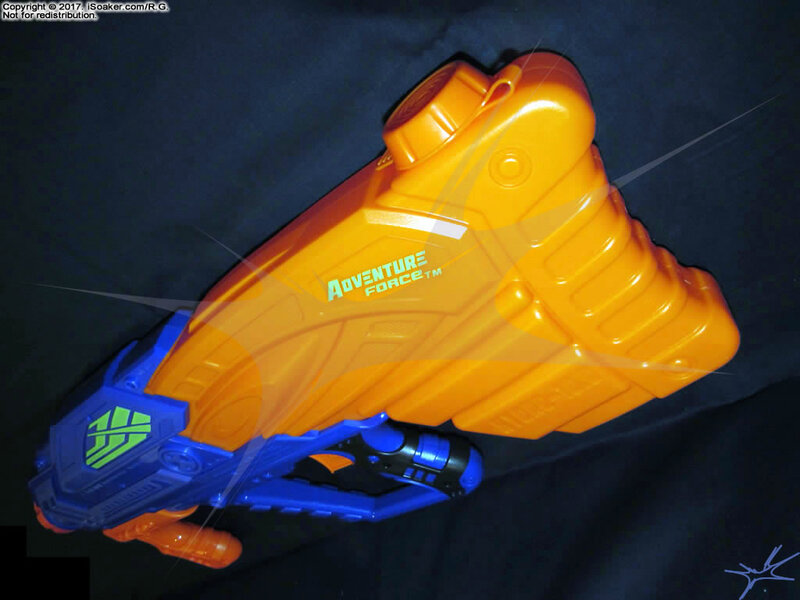 The smallest stream provides ~0.3x nozzle performance, but since the nozzle value locks itself open, it ends up continually firing for a good 5 or so seconds. 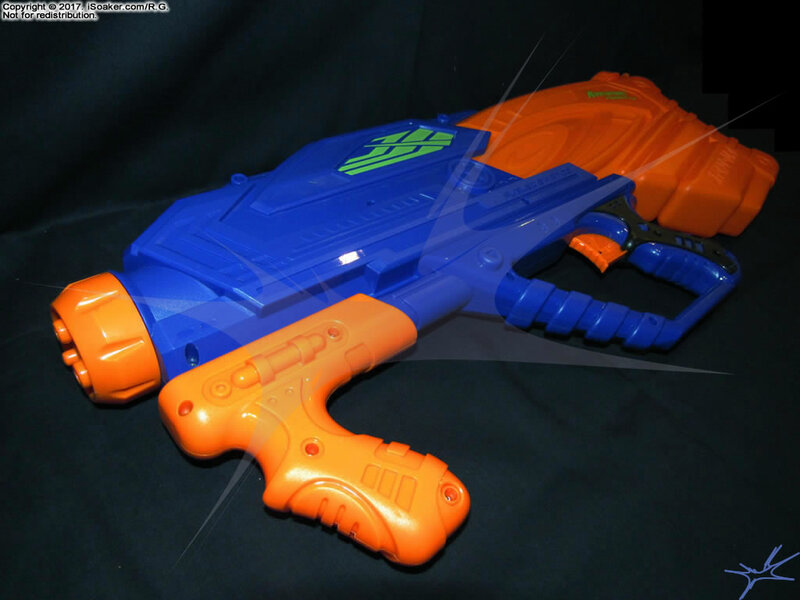 Thus, it really does not function well for conserving water if every shot tends to empty the pressure chamber regardless of the setting. 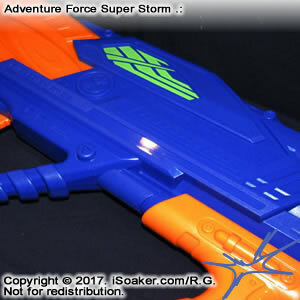 Moreover, the amount of capacity that the pressure chamber would accept is on the small side and surprisingly variable. 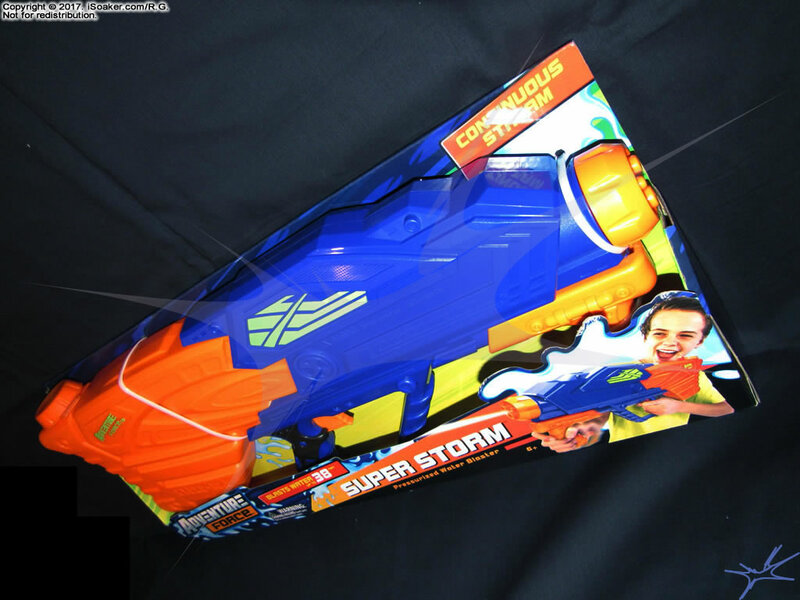 The most amount of water I was able to push into the chamber was around 65mL (~2.2 oz.). 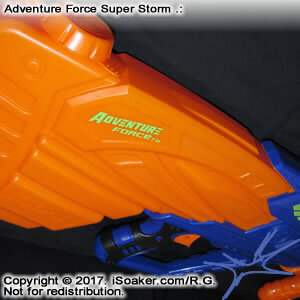 Update: The box states this water blaster can blast up to 38 feet; however, iSoaker.com range testing yielded far inferior numbers. 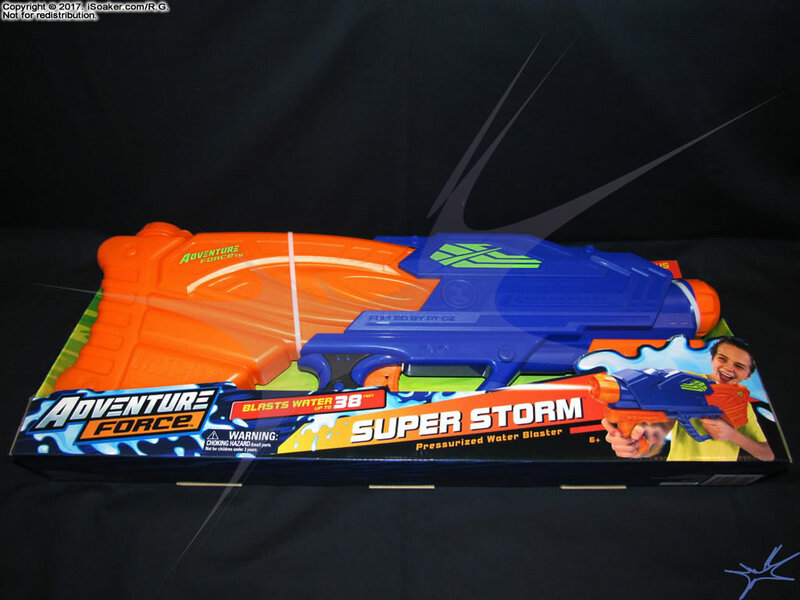 Level streams from all settings were reaching only around 20' (6.0m-6.5m). 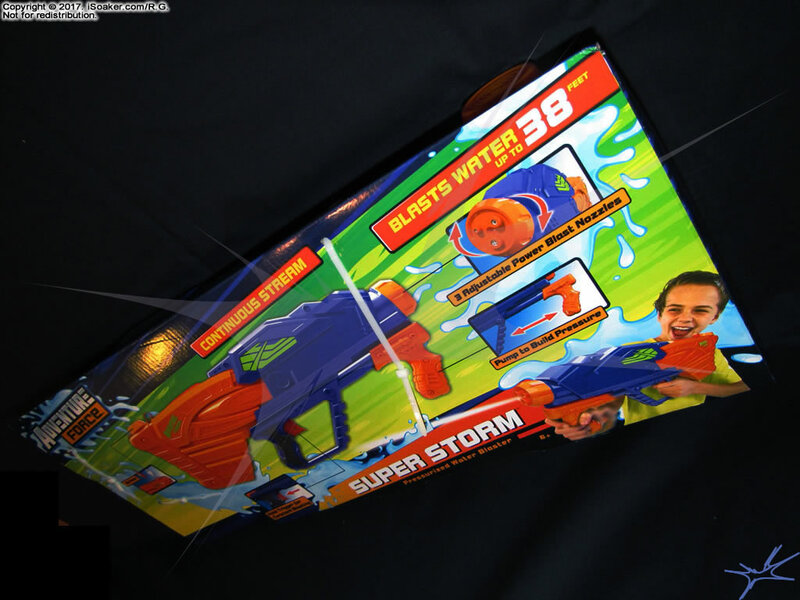 The largest nozzle (as expected) achieved the best range of ~33' (10.5m). 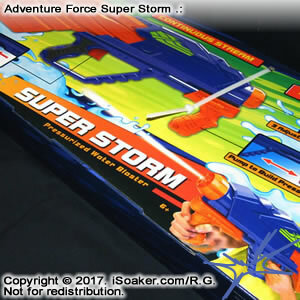 Considering its CPS-like pressure chamber, the Super Storm's range performance is lacking and partly due to the poor lamination noted for its streams. 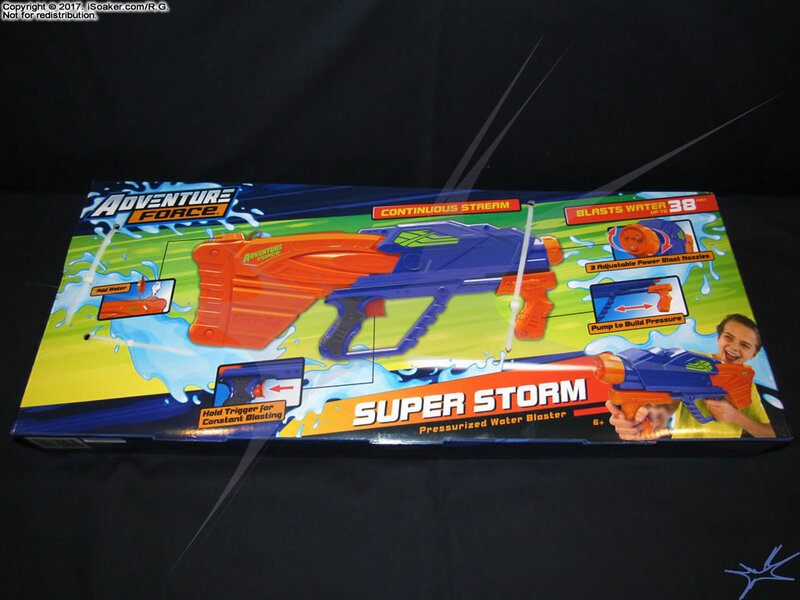 During range testing, the Super Storm also continued to fail at being able to perform any tap shots. 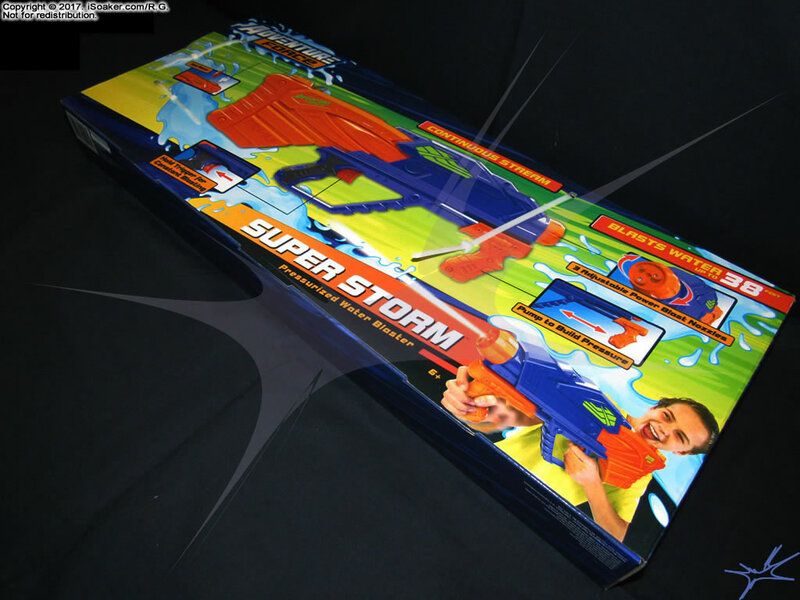 No matter which nozzle setting was chosen, after pumping to pressurize, one pull of the trigger will open the nozzle valve and the Super Storm will not stop firing until out of pressure even if the trigger is released. 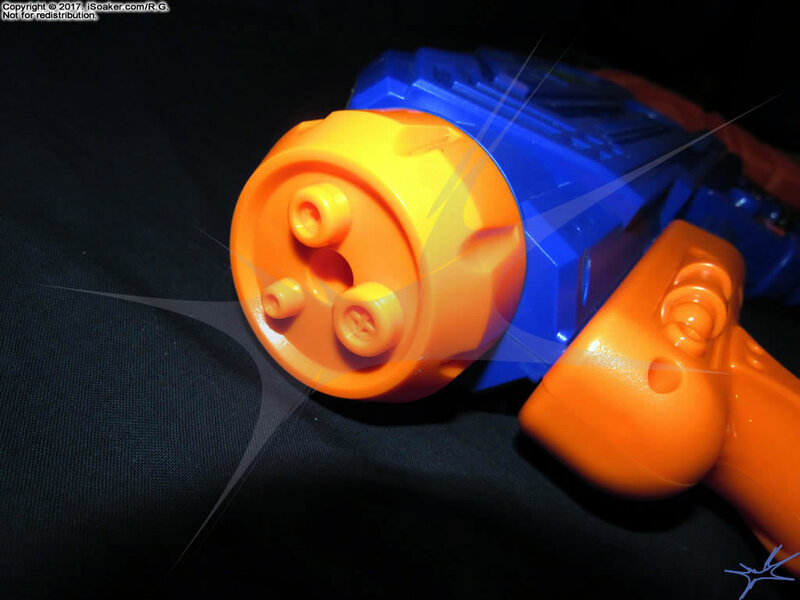 In short, the spring(s) for closing the nozzle valve are not strong enough to overcome the pressure of the water exiting. 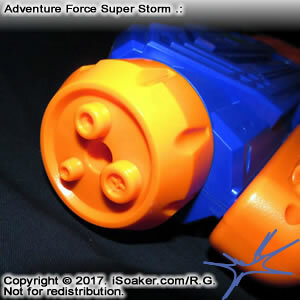 Beyond stream and pressure chamber volume inconsistencies, the Super Storm tested also seemed to insist on dribbling water out of a small hole at the base of the trigger/grip region between shots. 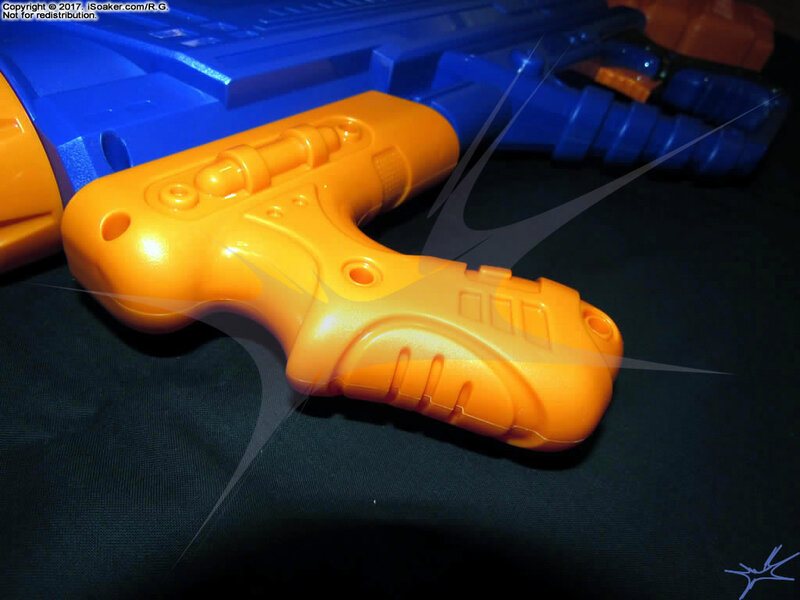 Exactly which part of the internals is leaking cannot be determined without opening the blaster, but the most likely joints are either the nozzle valve or the seal where the outflow tubing meets the nozzle selector. 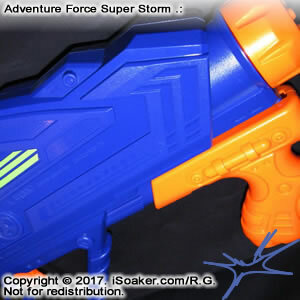 Roughly 2-3mL of water would dribble from the handle between shots; not enough to soak oneself, but more than enough to be rather annoying. 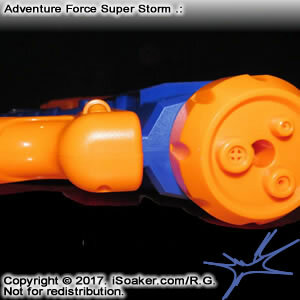 Overall, it is nice to see another company, Prime Time Toys, stepping up and making an elastic-based full rubber bladder water blaster with the release of the Adventure Force Super Storm. 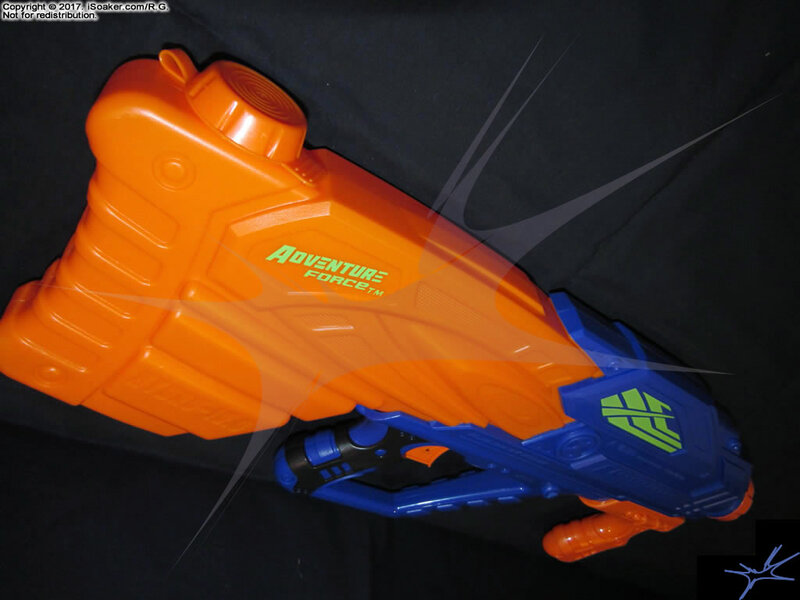 Unfortunately, while I wanted to like this water blaster, it simply possesses too many functional and performance issues for me to readily recommend it for its price. 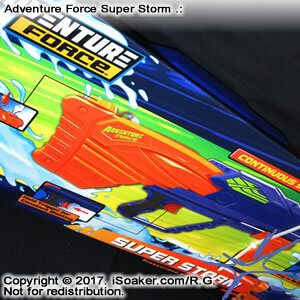 From its extremely low and inconsistent pump to its all-or-nothing trigger valve to its snap-cap reservoir and suboptimal balance, the Adventure force Super Storm behaves slightly worse than the spring-based 2016 Flood Force Power Core. 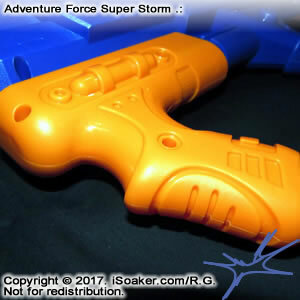 That said, taking it altogether, the Adventure Force Super Storm is probably best used as a loaner water blaster... for your opponents.